Thanks to their superb breathability, moisture wicking, odour-resisting and antibacterial properties, bamboo socks are a popular choice right now. Up to this point however, bamboo wearers have been pretty much limited to lightweight, standard thickness socks. 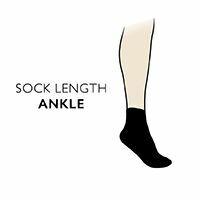 We’ve changed that with our own SockShop of London Bamboo Short Ribbed Boot Socks, made in England from a superb bamboo fibre blend. These socks are a thicker, more rugged knit ideal for boots and other wider fitting shoes, constructed with a looped pile sole, offering exceptional cushioning and three times more moisture absorption than cotton. If you prefer a thicker sock and have resisted bamboo until now, you have to try these!